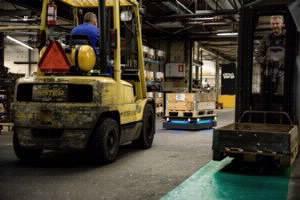 Every year, 100,000 pallets of materials and components arrive at Kverneland Group in Denmark. The materials and components are machined and fitted, so that finished agricultural machinery can leave the factory’s warehouse in containers. 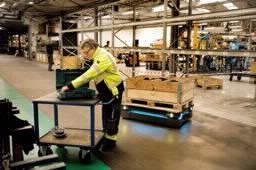 Around 500 employees share 55,000 m2 (592,000 square feet) of factory space with the company’s many powered pallet trucks and lifters, which constantly move all over the production site.. Kverneland is now using collaborative and autonomous mobile robots (AMR) from Mobile Industrial Robots to reduce the amount of indoor truck driving in order to improve the working environment and productivity. 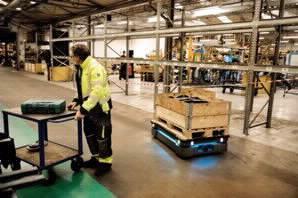 Kverneland examines how components are moved around and where it makes sense to transport the components using mobile robots on a fixed shuttle service or as a taxi service. 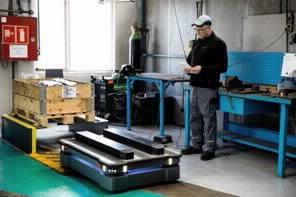 The size of the MiR robot is important, allowing it to smoothly deliver equipment on time, despite any obstacles along the route. 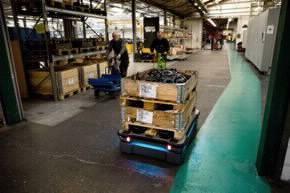 The robot operates on fixed daily routes, moving goods to four stations. It is a solution that can be scaled up by expanding the number of destinations or trips. MiR robots are designed to move safely among people by using built-in scanners, sensors and cameras. 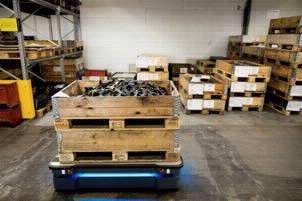 If we get 10–20 mobile robots, which replace the trucks, safety will be significantly improved, because it minimises the risk of collisions with people,” says Michael. Kverneland produces thousands of machines every year. 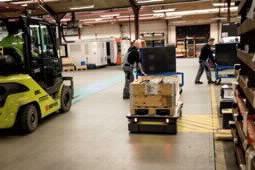 Before the machines are ready for delivery to customers all over the world, over 2000 pallets are handled every week. The operators in the welding and hardening plant are very pleased that they no longer have to look over their shoulder to see if a stacker or truck is in the area where they are working. At Kverneland, MiR500 moves between four stations where it delivers and collects pallets. 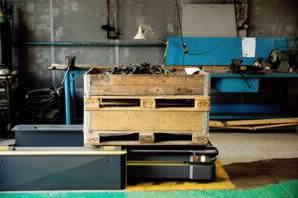 The robot is fitted with a pallet lifter, which can automatically load and unload pallets onto pallet frames.